It’s been a while since I’ve sat down and wrote a post (gotta love Tumblr and their re-post option) and for that I apologize. I don’t like to be MIA for long and well I’m back for an original post! YAY! If you go back to my previous original posts, I’ve been baking a lot of macarons and back in August I tried baking my macs with Rice Krispies. Those turned out great…. and well this is where the back story for this post comes in. A few weeks back, a friend of mine asked Sugar Bear (@SugarCrisp) on Twitter how they could use Sugar Crisp cereals (you know aside from just eating it with milk like you do with any other cereal), and Sugar Bear suggested baking Macarons with them. After I chimmed in about my Rice Krispies macarons and a few tweets back and forth, Sugar Bear hooked me up and sent me 2 boxes of Sugar Crisp to bake Macarons with. And here we are. Me, sharing the recipe with ALL OF YOU! After baking SO many macarons over the summer, I have found a recipe and temperature that has finally given me a consistent bake. So here we go. 1. Separate your 3 large egg’s egg whites from the egg yolk. 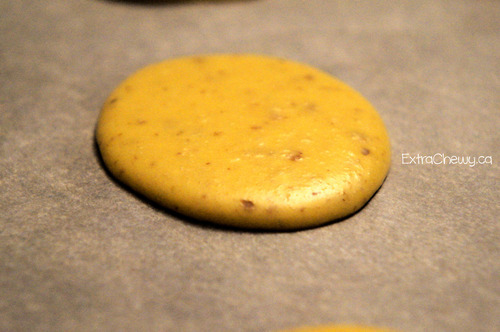 For better baking results, do this the night before you plan on baking your macarons. Just separate them in a bowl and saran wrap it, and keep it in the fridge overnight. 2. When you are ready to bake, sift the almond meal, confectioners’ sugar, and finely grounded Sugar Crisp together. This is how fine your Sugar Crisp should be grounded down to. This is how it should look when the 3 ingredients are pushed through the sifter together. 3. Put the dry mixture aside. Now if you have a stand mixer, use it. I’m writing the next few steps based on the use of a Kitchen Aid Stand Mixer. If you don’t have one, a hand mixer would do too, but note the consistency of the egg whites in the picture below. In your stand mixer’s bowl, put in your egg whites, a pinch of salt, and the ¼ cup of granulated sugar. 4. Set a timer for 2 minutes, and set the power level on the mixer to 4, and let it whip. When the 2 minutes is up, stop the mixer. 5. Set your timer for another 2 minutes and set the power level on the mixer to 6, and let it whip. When the 2 minutes is up, stop the mixer. Even though it’s peaked, the whites are NOT ready. 6. Set your timer for another 2 minutes and set the power level on the mixer to 8. Stop the mixer when the 2 minutes is up. 7. Set your timer for 1 minute and set the power level on the mixer to 10 (max power). Let it whip and stop the mixer when the minute’s up. Look for the clump of white to stay on the whisk! 8. 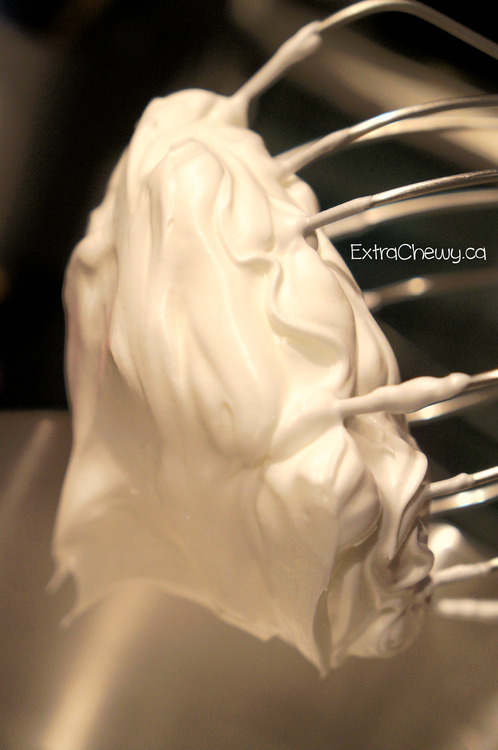 With a spatula, remove all the egg whites back into the bowl from the whisk. 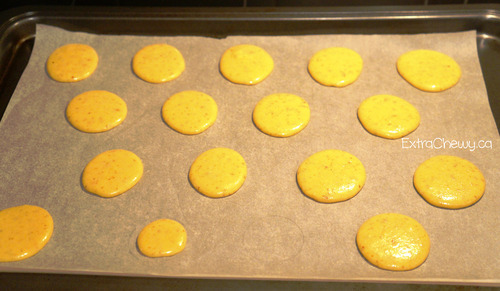 Fold in all dry ingredients (optional – added a tsp of yellow powdered food colouring at this point). You don’t have to be gentle with this folding. The objective here is to deflate the whites, but not over deflate it. You know you’ve got the right consistency is when you lift the mixture out with your spatula, it would ribbon back into the bowl. When you count to 20 and it incorporates itself back with the rest of the mixture with no lumps, we’re good to go. Here’s a great video on how to incorporate your dry and your wet ingredients! 9. Put the mixture in a piping bag. Use tall plastic cup or glass to hold the bag open for you. 10. Pipe the mixture at a 45 degree angle onto a parchment lined baking sheet. The Mixture should pipe out to 1″ circles and leave some space around each mixture blob for them to expand (You’ll understand why on the next step). To help with consistency, you can draw out 1″ wide circles on the back side of the parchment before piping (ok before step 1). 11. Once all your mixture is pipped out, take one of the baking sheet and tap it on your kitchen counter. Rotate 90 Degrees – Tap. Rotate – Tap. Rotate – Tap. Tap each side 2-3 times. This allows the mixture to flatten and spread a little as well as removing the air bubbles in the mixture. 12. Preheat your oven to 300 Degrees F. LEAVE the baking sheets on the counter (away from the sink) and let the mixture sit for 25-30 minutes. We do this so that a “skin” forms on the mixture. After 25-30 minutes, the top of each “blob” of mixture should be dry to your touch. 13. Set your oven timer to 16 minutes, then a 2nd timer at 8. Pop your baking sheet in the oven and watch it bake. When the 8 minute mark comes, rotate the baking sheet and continue baking for another 8 minute. 14. Let the Macs rest on the baking sheet for a couple minutes, then pull them off (along with the parchment) onto a cooling rack to cool. OK! Onto the Buttercream filling! 1. Cream the butter and marshmallow fluff together. 2. Slowly add in the confectioners’ sugar ¼ cup at a time, scraping down the sides of the bowl after each addition. 3. Lastly, add the vanilla and the crushed Sugar Crisp. 4. Beat the mixture until creamy. 5. Pipe filling onto a cooled macaron cookie and sandwich with another. Repeat until all cookies are used. 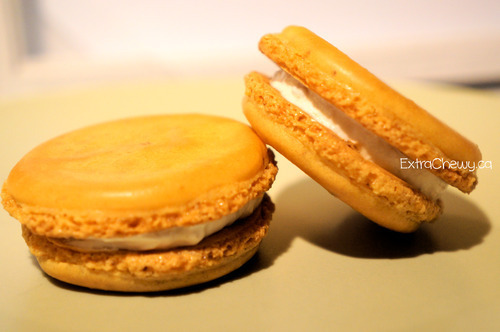 This Recipe yields about 16 macaron sandwiches.